The Moroccan Rose collection from REN only using the finest oil from the Dades Valley in Southern Morocco. Using only genuine rose oil pressed from thousands of rose petals, this REN Moroccan Rose collection is addictive, pure and certainly a heaven for the senses, that synthetic fragrances can never duplicate. 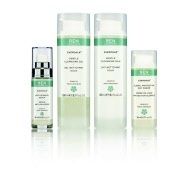 Why choose REN Moroccan skincare over other REN skincare products? The only range using pure Moroccan Oil that has relaxing and therapeutic properties, although this range will also work well along-side any of the REN product portfolio. What are the benefits of using REN Moroccan skincare? Calming, Soothing, hydrating and repairing and is perfect for those who prefer using oil based products over moisturisers. REN Moroccan Rose Otto Body Wash is a sulphate-free, calming and soothing gel suitable for the shower or bath. Experience firming, hydration and radiance with this REN Moroccan Rose Otto Ultra-Moisture Body Oil. REN Moroccan Rose Otto Body Lotion calms, hydrates and nourishes the skin. REN Moroccan Rose Gold Glow Perfect Dry Oil helps to nourish and restore the skin's barrier function.